PID control with self-tuning or ON-OFF with hysteresis. 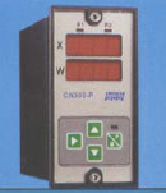 Input type configurable by keyboard for thermocouples J, K, S and Pt100 thermoprobes and current inputs 0-20 mA, 4-20 mA, 0-10v or 2-10 v.
Auxiliary power supply for two-wire transmitters. Format 48x96. Panel cut-out 44x92 + 0.8 mm.